Moses set the Law before the people and let them know that were choosing Life or death in whether they followed it or not. Jesus too invites us to wisdom of seeking his teaching. My homily for this weekend is posted here. Today is the solemnity of the Sacred Heart of Jesus, the titular feast of the parish where I work. I wasn't able to plan anything big because we have the graduation exercises of our parish high school today. That's good enough for the Sacred Heart; he'll be happy. I don't know if this is a true story or not, but it sure is funny. When I was a student in Ireland there was this pub that displayed a picture of the Sacred Heart of Jesus. Someone told me that people liked to toast the Sacred Heart saying, "Here's to the Sacred Heart, may God bless him!" Realize that you were ransomed from your futile conduct, handed on by your ancestors, not with perishable things like silver or gold but with the precious Blood of Christ as of a spotless unblemished Lamb. We all suffer with "futile conduct," whether we call it sin, maladaptive behavior, addiction, or what have you. It's all the misguided stuff we keep doing (insanely) because we believe (wrongly--and against repeated evidence!) that it will bring us happiness or peace. Our spiritual task is to realize, to make real in our own daily lives, our deliverance from such things through the power of Christ's Passion and Resurrection. A lot depends on what we say to ourselves about what we see. After the consecration my chalice caught my eye. I noticed that the inside was very dirty, as if the Sunday sacristan had neither purified nor washed it after Mass (I didn't use it yesterday). Of course I felt bad for using a dirty chalice for Mass. I was also also annoyed at the sacristan, of course. Then a little later, when I went to communicate the server with the Precious Blood, my chalice looked clean. Examining it myself after Holy Communion but before I purified it, I saw nothing of the dirtiness that I had noticed during the post-consecratory epiclesis. So what's up? How do I interpret my experience? Do I confess to having a vision by which I am warned that it is the sin of sacrilege to offer Mass when my life of prayer and devotion is otherwise neglected? Or do I just say, "Maybe it was the lighting." I don't know. It's the sort of thing that makes me realize once again that how we interpret our experience makes all the difference for the life of spiritual discernment and thoughtful discretion. To my mind, Corpus Christi should have been this past Thursday. Nevertheless, it is a joy to celebrate the tremendous gift of the Lord's Body and Blood. My homily for this weekend is posted here. Our fifth graders invited me to visit and teach them about the sacrament of Order. So today I went over and led them through a little reflection on oversight, teaching, and the ordered assembly in which we Catholics pray. Kids understand the need for these ministries right away when you have them imagine a school without teachers or a principal. They had endless questions about things like liturgical prostration, laicization, and (in their own words) the distinction between the religious and clerical states. But to my great surprise, none of them asked me about clerical celibacy or the reservation of ordination to men. I couldn't decide whether to be relieved or disappointed! The God who is an eternal self-expression invites us into the loving mystery of God's own divine self. My homily for this weekend is posted here. I was reminded of this today on Whispers. I think it's too funny. as he exhorted his priests to stay faithful to the "Divine Office" in his most recent Chrism Mass homily Boston's Cardinal Sean O'Malley OFM Cap. made a crack about the "breviary adjustment service." "For a very reasonable fee of $25," O'Malley said that "the service provides that within hours after your death someone will go to your rectory and place the ribbons in your breviary in the proper corresponding places," adding that "there is a special supplementary service offered for Bishops. "If the Bishop expires while reading the minutes of the presbyteral council they will come and put the Imitation of Christ in his hands," he said. "It is what the Irish call cleaning up the obituary." This afternoon I led the young people of our grade school in the May Crowning. 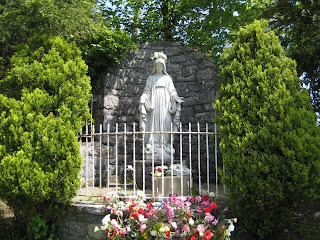 Here she is, in the the little football pitch and multi-use outdoor space we call "Mary's Field." This is the kind of thing that makes parish life special. Pray for us, holy mother of God! It has always intrigued me to think that Our Lady chose to appear in a place called Fátima. Fatimah was, of course, the devoted daughter of the prophet Muhammed (peace be upon him) and the wife of his cousin Ali ibn Abi Talib, from whose succession Shia Islam derives. The apparitions of Fátima have always been associated with the conversion or consecration of Russia and the struggle with communism, but perhaps now, in another historical moment, Our Lady wants to help us overcome our real or imagined conflict with Islam. Check out this beautiful post from Brother Chris. The fulfillment of all the mysteries of the Lord is upon us. My homily for this weekend is posted here. Today we hosted a visit from our Capuchin brother Giuseppe Germano Bernardini, archbishop emeritus of Izmir (that's Smyrna, you know.) He had with him two American friends, one of whom turns out to be a sister blogger who goes by the wonderful name Totus Tuus. They were all promoting the cause of Sr. Marie de Mandat-Grancey, who was instrumental in getting the devotion to Mary's house in Ephesus started. Go ahead and print out a prayer card here, and let them know of any favors you receive. It was a inspiring visit and their devotion made my day. Then, to top it all off at the end of their visit, Bishop Bernardini told me that his own parents have been declared servants of God! You can check them out here. P.s. Thanks to Pia for this more detailed link to information on the sanctity of Sergio Bernardini and Domenica Beddoni, Servants of God. and make us temples of his glory. It is an outrageous prayer, to ask to be made into a temple of the Holy Spirit. But it's a prayer we can make in the courage of the Resurrection. What is a temple? It's a place of prayer and sacrifice. Thus in our novena of these days we ask to be made into places of prayer in the world, that the Holy Spirit would pray in us and catch us up into the prayer of Jesus to the Father. Just as the Spirit conceived Jesus in the womb of Mary, so the Spirit conceives us anew that we might be born again into dynamic life of grace which is the Trinity of God. We also pray to become places of sacrifice, that we would learn how to break our pride and hardness of heart and so become the Body of Christ, broken for the reconciliation and healing of the world. This afternoon we hosted the Jubilees of religious profession Mass for one of the local communities of sisters. One of the nuns was celebrating 75 years of religious life. Can you imagine that? I asked her if she had any advice for younger religious. She said, "In religious life it's best to keep your advice to yourself." Now there's someone who has been around the block living in community! My favorite local example of this is the window sill down the hall, across from the washer and dryer for the brothers on this floor. On it is a statue of Our Lady, and she is perpetually surrounded by rosaries that have become lost and impossibly tangled in the wash, as well as an ever-revolving collection of unmatched socks. The Incarnation of the Word, which is at the heart of our Christian confession, teaches us that in the humility of God, the divine Presence is to be found here on earth, hidden in the ordinary. Today, on the Ascension of the Lord the angels asked the apostles, "Why are standing there looking at the sky?" We might occasionally ask the same question of ourselves in our own prayer, when the Word and Spirit of God has already willed to descend to us and hide among us down here.